The focus of All My Friends Are Rock Stars is the local rock’n’roll scene during the late eighties and early nineties in the geographical triangle of Rockford, Illinois; Madison, Wisconsin; and Milwaukee, Wisconsin. While that is a fairly narrow spotlight, for those who were involved in those scenes, it makes for an interesting review of the bands, clubs and underground publications of that era. For the wider audience, there are also early stories of bands that made it out of the local scenes to achieve some level of national or international recognition. 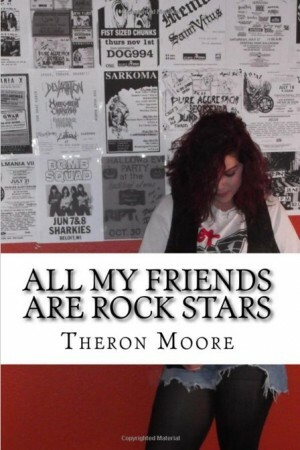 Essentially a collection of interviews that often intertwine, Theron Moore has put together a book that could be defined as an oral history of the described upper Midwest rock scene. There are many interesting, funny, and sometimes tragic stories presented about those who toiled for their art in relative anonymity, but the most interesting tend to be about those who clawed their way up to the next level. Interviews include Bun E. Carlos of Cheap Trick, Bill Feeny of The Appliance S.F.B., Dan Hobson of Killdozer, Bucky Pope of The Tar Babies, and Paul Schluter of Last Crack. It’s both fun and cathartic to witness the way in which these groups grew and broadened. Moore has been freelance writing since 1989, publishing articles and poetry in multiple Midwestern music magazines and websites. In 2011, he edited and self-published his first book, Gangsters, Harlots and Thieves: Down and out at the Hotel Clifton. The author has more books planned for the coming years. All My Friends Are Rock Stars is available on Amazon.com.